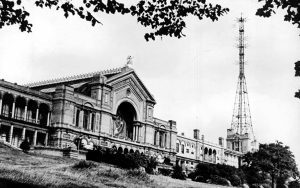 The very first official broadcast on British Television is being recreated by the BBC exactly 80 years after it made history. Television’s Opening Night: How the Box was Born will re-stage the event that originally took place at Alexandra Palace on 2nd November 1936 on the same day in 2016. The broadcast consisted of a news bulletin, the British Movietone News, followed by an entertainment medley of variety acts and dancing girls including comedians Buck and Bubbles and Chinese juggling act The Lai Founs. Since there is no surviving footage of that show, the BBC4 programme will re-shoot it with new performers but using the original technology and filming techniques. The evening of programmes will also tell the story of TV’s birth, including the battle between two rival camera technologies that competed to take control of the fledgling industry. The system that went first on opening night was a seven feet tall mechanical monster built by John Logie Baird’s company. It was called the “Flying Spot” and at its heart was a huge steel disc spinning almost at the speed of sound.